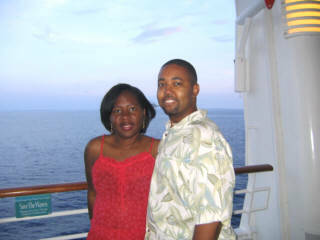 This was the second Tom Joyner Foundation Fantastic Voyage Cruise for Traci and me. The cruise was even better than last year. I think we are hooked. The Concerts: The concerts continue to be the major draw for me. Earth, Wind & Fire, Babyface, Teena Marie, Third World - this cruise is paradise for music lovers. The Drink Tank: Ironically, this was one of my favorite events last year. This time, I was quite disappointed. Once again, the Drink Tank consisted of a panel of foul-mouthed comedians giving ridiculous answers to questions from the audience. However, this year, the event degraded into the comedians shouting insults and obscenities at each other and the audience in hopes of getting laughs. It was on the verge of being out of control. Standing in Lines: Waiting in line has become part of the experience. There are lines to get into the evening concerts, lines to get off the ship, lines to get on the ship, lines for the buffets, etc. Tom Joyner has tried various methods over the years to reduce the lines for the concerts but nothing has been an overwhelming success. Frankly, I'm not sure if anything can be done. Traci and I have just learned to deal with it. We played some very competitive games of Scrabble on Traci's Palm Pilot during our waits. Traci won most of the time:(. Our trip did not start off too good this year. We had planned to fly to Miami on Friday evening to attend the official Fantastic Voyage Bon Voyage party in downtown Miami and then board the ship the next day. We ended up missing our flight out of Phildelphia because we got caught in a 9-mile traffic jam. My heart sank when the lady at the USAir counter told us there were no more flights from Philadelphia to Miami that evening. Instead, she booked us on the first flight to Miami leaving the next morning. She was nice enough to print our boarding passes the night before to guarantee us seats on the oversold flight. We ended up spending Friday night at the Philadelphia Airport Marriott. I did not want to take a chance on missing our Saturday morning flight. The cruise ship was scheduled to depart Miami at 5 PM - with or without us. Our stay at the hotel was free, thanks to the Marriott points Traci had accumulated through business travel. We made it to Miami around noon on Saturday. Tom Joyner had arranged for buses to shuttle people from the airport to the ship every half hour. Our transfer from the airport to the ship went smoothly. It felt great to be onboard the Royal Caribbean Navigator Of The Seas for our second Fantastic Voyage. This year, each person received a copy of Tavis Smiley's latest book, The Covenant With Black America, when boarding. The book had just made #1 on the New York Times best seller list. Way to go, Tavis! There was a bottle of champagne and cookies waiting for us as we entered our inside cabin that overlooked the Promenade Deck. After dropping off our carry-on bags, we headed to the Windjammer Cafe for a quick bite to eat and then made our way to the Pool Deck for the Sailaway pool party. The atmosphere was quite festive. There were people line dancing. Others were kicking back with a drink. Wearing my Hampton University T-shirt for Represent Night, I found myself greeting other Hampton alumni. Traci was throwing up the Delta sign and doing the Delta call as she encountered countless sorors. It was a really good time. Most of the people we met had done the Tom Joyner cruise before. There were a few that had been coming every year since the first one. Of course this wouldn't be a Tom Joyner cruise without celebrity sightings. Fred Hammond chilling on the pool deck, J. Anthony Brown humming as he strolls the Promenade Deck, Stephen "Cat" Coore of the Third World conversing with his sound crew, Ms. Dupre waiting for the elevator, Tom Joyner and his wife Donna Richardson greeting fans in the lobby - all these sightings within the first hour of boarding the ship. Tom seemed to be loving every minute of being with his fans. He greeted Traci with a big hug and then posed for a picture. The joy of being on the ship had eclipsed our rough start to this vacation. 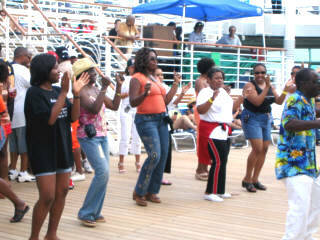 "Line dancing at the Sailaway pool party"
The concerts are my favorite part of this cruise. These took place during the evenings at venues all over the ship. Although, we were on a different ship than last year the lounges and auditoriums were in the same locations but sometimes with different names. The Metropolis auditorium has somewhere between 1500 and 2000 seats. The concerts in here started at 9 PM each night and lasted for 3 to 4 hours. The Studio B auditorium is ordinarily an ice skating rink with several hundred seats surrounding it. However, on the Tom Joyner cruise, the rink is converted to a dance floor and a stage is added to one end. Concerts began at 2 AM in here and ended around 3:30 AM. Like the Metropolis auditorium, Studio B has high tech computerized light effects and an advanced sound system. The Ixtapa Lounge and the Viking Crown Lounge are much smaller than Metropolis and Studio B. The seating in these lounges surround small tables for drinks. The Ixtapa lounge seats around 300 people and the Viking Crown Lounge seats less than 100 people. There are only a few seats in Viking Crown that give a clear view of the performers. There are many seats in there from which you can only hear the performance but not see it. Traci and I had seats in the Viking Crown Lounge twice that only allowed us to see the backs of the performers. There were other venues on the ship such as the lobby, the Schooner Bar, and the pool deck. In the evenings, there seems to be live music all over the ship. All of the acts are top quality. Tom Joyner and his staff definitely have a knack for finding talented musicians. Some of the entertainers had also performed on the cruise last year. It was interesting to see how some of them had received somewhat of a promotion. For example, last year, Kem performed two shows every night for five nights of the cruise in the small Viking Crown Lounge. This year he performed only two shows in large Metropolis auditorium. Michael Ward, who performed in the ship lobby last year, graduated to the Viking Crown Lounge. The entertainers are evidently treated very well on this cruise. We heard many of them talk about how much fun they were having. Some would ask Tom during their concerts if he would have them back next year. Bobby Brown said, "I'm being a good boy." after telling the audience he wants to come back next year. Kem/Whoopi Goldberg/Earth, Wind & Fire: [Metropolis] The first half of this 4-hour concert was grueling. Kem was good but singing slow music late at night caused many of the weary travelers in the audience to dose off. Whoopi seemed so excited to be performing. Her stand up routine was great. But even she couldn't keep some people from nodding off. However, when Earth, Wind & Fire took to the stage and hit the audience with their powerful brass section and energetic performance, the audience suddenly got its second wind. Bassist Verdine White made certain the crowd was into it by walking through the audience while playing a bass solo. EWF was outstanding. Zapp: [Studio B] Zapp was well beyond my expectations. This high-energy funk band seemed to change clothes every other song. One of the costume changes included a big guy wearing a diaper with flashing lights. The sound was incredible. I thought I was going to have a sore neck from bobbing head so hard to the music. Unfortunately, this concert started at 2 AM and I could not hang past 3 AM. Traci did not attend this one. Chuck Brown: [Ixtapa] This one turned into a big dance party. I found it nearly impossible to sit down during these non-stop go-go rhythms. Third World: [Pool Deck] We only caught about a half hour of this performance because we needed to get to the tiny Viking Crown lounge early to increase our chances of getting a seat. However, in the short amount of time we were there, we witnessed the extreme talent of the members of Third World. They often took long instrumental solos. The drummer even tapped out a solo on the strings of the guitar player's guitar. It was amazing. Babyface/Wanda Sykes: [Metropolis] Babyface tore it up! He was joined by his brother, Kevon, near the end of his set. Wanda Sykes surprised me. I never cared for her comedy on TV, but her stand-up routine on the ship was quite funny. Michael Ward: [Viking Crown] Michael Ward and his band gave a nice smooth jazz performance on his electric violin. Teena Marie/Tommy Davidson/Frankie Beverly: [Metropolis] A good old school concert. Tommy Davidson was hilarious. Mel Waiters: [Ixtapa] Mel Waiters music is described as hole-in-the-wall blues. I'd never heard of him before this cruise. Traci and I were open to hearing new music so we went to his concert. Mel and his band did a nice job playing blues, soul and even a few modern covers. In fact, the audience asked him to come back for an encore, which Mel gladly obliged. Joe McBride: [Viking Crown] Joe McBride is a blind keyboard player who plays smooth jazz. His set was very good; however, I was blown away by his saxophone player. We heard many sax players that week who had technical skills and could play a lot of notes fast, but this young guy could do it with feeling. Even when he paused in his solos, he had the audience on the edge their seats waiting for the next note. In my mind, this guy stole the show. Sommore/Sheryl Underwood/Adele Givens/Bruce Bruce/Earthquake: [Metropolis] This show featured some of the top comedians in the industry. If you are looking for good clean comedy without all the foul language, this is definitely not the show for you. The comedians were funny but quite vulgar and obscene. J. Anthony Brown was the emcee for this concert and many other musical concerts during the week. Most of the musical concerts also included a comedian as the opener or filler while the technicians were setting up the stage for the next act. J. Anthony Brown always opened the shows with a disclaimer that went something like this: 'This is a cussing show. If any of the following words offend you: [list of cuss words]. You need to get the #@$% out now!' This comedy show was definitely no exception. His wife, Whitney Houston, calls him The King Of R&B. I'm talking about none other than, Bobby Brown, a former member of the group New Edition turned solo artist. Without a doubt, there was no other entertainer that created more buzz on this cruise than he. Over the years, the tabloids have had a field day reporting his run-ins with the law, his rumored maritial problems, and other mishaps. Add to this the success of his reality show, Being Bobby Brown and you've now got the most anticipated concert on the cruise. Bobby Brown has had a reputation as a 'bad boy' who has also occasionally been a no-show at various events. All during the day, you could feel the anticipation of this concert. By midnight, the line for this 2 AM concert had already expanded to two decks. Traci and I decided to take advantage of this time to see Michael Ward perform smooth jazz in the small Viking Crown Lounge at 1 AM and then try our luck at getting into the Bobby Brown Concert in Studio B. We made it to Studio B about 2:20 AM and it was standing room only. Even some of the Royal Caribbean staff had come to see the performance. There were so many people, Traci and I could not even see the stage. We had to look at the TV monitors to see what was going on. We eventually inched our way to the top of the steps where we could see the stage. Bobby sounded great and his band was tight. He is an outstanding performer. He gyrated, stood on the speakers, took off his shirt, and totally drew the crowd in. Even when his voice started to wear out near the end of the show, he still went for the high notes. Sometimes he hit them and other times he did not. It didn't matter. People were more interested in what he was going to do next. I came back to the next night to see the concert since I had missed the beginning. I ended up staying for the whole thing. I was glad I did. It turned into a jam session that included Bobby and Babyface (wrote many of Bobby Brown's hit songs) singing together. Rapper, Doug E. Fresh also joined Bobby on stage and the two of them took turns beat boxing. The Bobby Brown performances had lived up to all the hype. I'll admit I had second thoughts about attending a Sunday morning worship service scheduled from 9 AM to 1 PM! This event took place in the Studio B auditorium of the ship. I could tell we were in for a treat when we entered. Even though people had options such as sleeping in or going ashore to enjoy Freeport, Bahamas (our first port of call), the auditorium was jam-packed. Tom Joyner had announced that he received complaints because he didn't have the worship service last year. The ship left from Puerto Rico on Sunday evening last year so it would have been impracticle to hold the event. But with the ship leaving Saturday evening this year, the Sunday morning service had been resurrected.